softEnergy GmbH located in Rostock was founded by a young and innovative team in 2004. Software development, distribution, integration and administration of user software for the renewable energy industry are tasks of softEnergy. 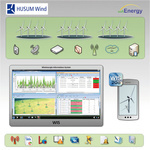 WIS - Wind energy Information System is the main product of our company, a software that manages the technical and commercial operation and controlling of wind power plants as well as wind farms. Communication solution that is independent on the WTG manufacturer, supports nearly-live data monitoring of the wind farms and will be installed into the WTG's. Communication solution for the automated data collection of the WTG raw data without the need for installing it in a WTG or in a wind farm. From the very beginning softEnergy has not only targeted German customers, but also actively focuses on the international market. The primary objective of softEnergy is to provide customers in the field of renewable energy with software products and services that lead to optimization and thus a higher yield of their energy facilities. On this year’s trade fair the software producer softEnergy GmbH in hall 4, booth 4B16, presents innovative solutions for the wind market. The managing director of 11 years Elke Stahl has handed over management to her successor Thomas Niestaedt on 01.10.2015.